No actual writing this week, just more planning, but we did go to our first musical event of the year last night – a gig by Molly Lewis. The first thing I need to mention about this particular show was the venue – a real live human being’s front room. Okay, we weren’t all sitting round the fire in great grandma’s Victorian armchairs or anything like that – this was a loft in Vancouver after all – but there was a sofa and a computer and food in the kitchen and somewhere, a cat. It was also the perfect location to see the charming Molly Lewis play. 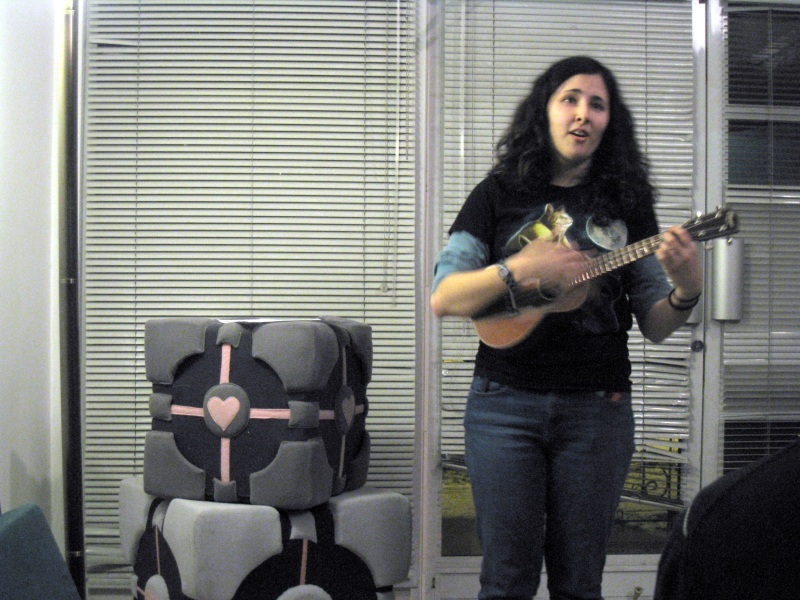 If you aren’t familiar with her, she plays the ukulele (and sometimes, a kazoo) and sings about Mr T, Stephen Fry, MySpace and beards. Basically, she’s George Formby for the iPhone generation. She also isn’t sure how many songs people expect at a $5 show. In this case the answer was ‘we don’t really care’. I would guess there were about 30-40 people there last night but a lot of them already knew each other so it felt like a group of friends hanging out rather than a gig. Molly’s a great singer and her songs appeal to our sense of humour so we both really enjoyed ourselves. If you get the chance to hear her play, and you’re into pop culture, I highly recommend you go. Thankfully, Vancouver’s imminent snow storm held off long enough that the walk home was only mildly hazardous.